President Mahinda Rajapaksa and First lady Shiranthi Rajapaksa visited Lumbini, the birth place of Lord Buddha on Friday 30th. Nepalese children welcomed the President and the Sri Lankan delegation on arrival at one of the most holiest places for Buddhists all over the world. 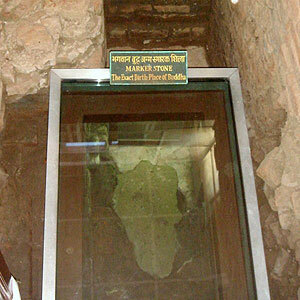 President lit up oil lamps near Asoka Pillar,which was discovered in 1896 by Nepalese archeologists. 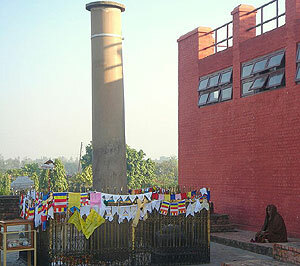 The great stone pillar at the site, marks the spot of Emperor Asoka's visit to Lumbini during 269 to 232 BC. President Rajapaksa officially opened the newly built Sri Lankan Monastery funded by Sri Lanka Lumbini Development trust.Later he donated One Million US Dollas for Sri Lanka Lumbini Development trust to the Minister for Federal Affairs,and Culture Dr.Minendra Rijal of Nepal . President of the Sri Lanka Lumbini Development Trust,Minister Chamal Rajapaksa, Tissa Karaliyadda and the Sri Lankan delegation were present at the religious ceremony. 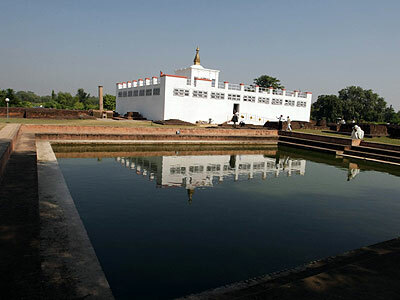 Lumbini, Gautham Buddha's birth place is a Buddhist pilgrimage site in the Kapilavastu district of Nepal, near Indian border. 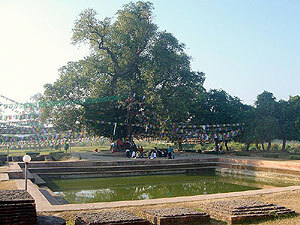 In 1997 UNESCO specifically nominated Lumbini as a World Heritage Site under the International World Heritage Programme.